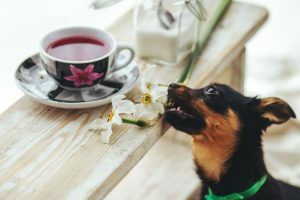 If your dog is attached to your house and is accustomed to living in a familiar environment, you may want to consider having a dog sitter come to you. 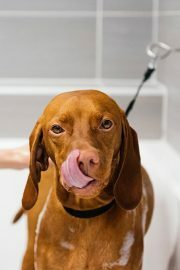 Dogs may be more comfortable staying in a setting and routine they’re used to. As an added bonus, someone will be watching over your house when you’re not there. 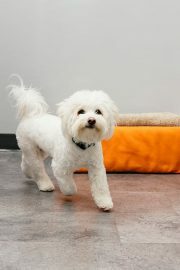 Doggy daycare allows your dog to join their furry friends in open play in a safe, monitored environment. 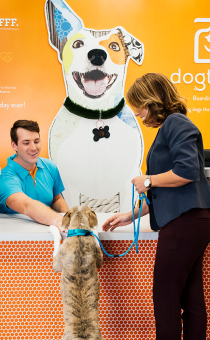 At Dogtopia, for example, a staff member fully certified in dog body language and behaviour supervises the dogs at all times and all pooches are thoroughly checked for any health issues and physical ailments before admittance. 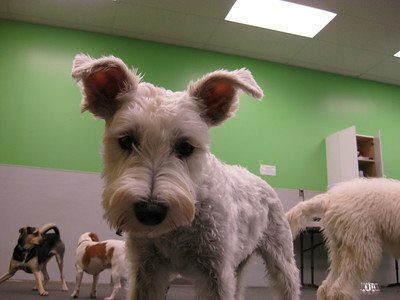 Dogtopia also provides web camera access to their clients, allowing dog owners to check in and see how their pet is doing, anytime and from anywhere. Spending some time in daycare allows dogs to socialize with other dogs as they are naturally social animals and want to belong in a pack. Active play lets dogs stay physically fit, which reduces destructive behavior at home and helps maintain a healthy body weight. Also, a day of doggie daycare is often priced comparably to an hour of dogwalking. If you would prefer to supervise your dog’s playtime yourself, fully fenced off-leash dog parks can be a treat for both dogs and their owners. Dog parks allow your pet to socialize with other dogs of every size, breed, age and temperament. 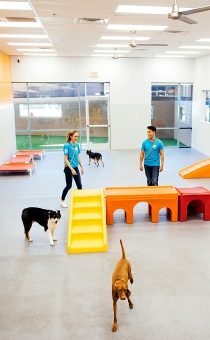 They learn how to communicate with other dogs in an open environment. It’s a good place to tire out your dog while they play with others. Dog parks also provide an opportunity for dog owners to socialize with other owners and get some exercise themselves. Whenever it’s possible, you can always take your pooch with you. More and more businesses are becoming dog-friendly and are willing to accommodate your pet. If your dog is social and won’t be disruptive, then this option might be for you. Whether you’re considering taking your dog with you on vacation, or taking your dog with you to your office, just be sure to check beforehand to make sure this is allowed. 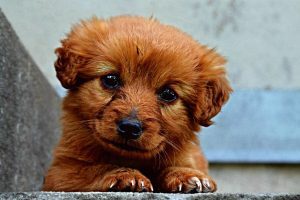 If possible, try to bring your dog to the new place beforehand for a short visit to get them accustomed to the environment and make it a less stressful transition. 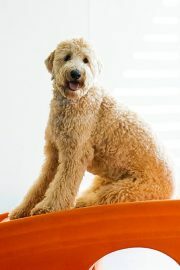 Want to exercise your dog and build a strong relationship at the same time? Dog obstacle courses are the good place to try. As dogs are natural hunters, chasing and running comes with their animal instincts. Jumping over obstacles and maneuvering through different pathways not only fulfills their hunting and chasing desires, but also gets rid of excess energy and weight. 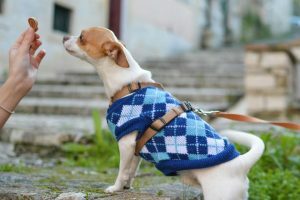 It also helps strengthen dog/owner communication and improve your dog’s behavior as your dog has to follow your directions to get through the obstacles. 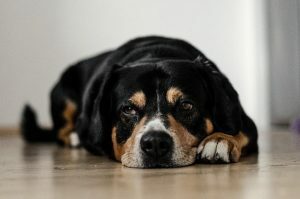 If you can’t take your dog to an obstacle course near you, there are plenty of online resources about how to make your own obstacle course at home.